TERRIBLE VOYAGE MILES OF ICEBERG AT CAPE HORN. LONDON, August 3.The barque Alice, from Auckland to New York, has arrived in port after aterrible voyage. She was locked whenrounding Cape Horn between a sheet of solid ice on her port side, while an iceberg 40 miles long and 400 ft. high occupied all the sea room to starboard. The Alice only escaped from this perilous position with great difficulty. This mass has received the various denominations of an immense iceberg, an ice island,' groote ijseland,' and a connected mass of icebergs. Its elevation in no case exceeded 300feet, but its horizontal dimensions were sixty miles by forty. ANTARCTIC WHALING EXPEDITION. AN ENORMOUS ICEBERG. A Dundee whaler reports that thewhaling expedition to the Antarcticwlrjch set out from the Falkland Islands has proved a failure. Plenty of whaleswere met with, but they were not of the Greenland kind. An iceberg 50 miles in length was seen. 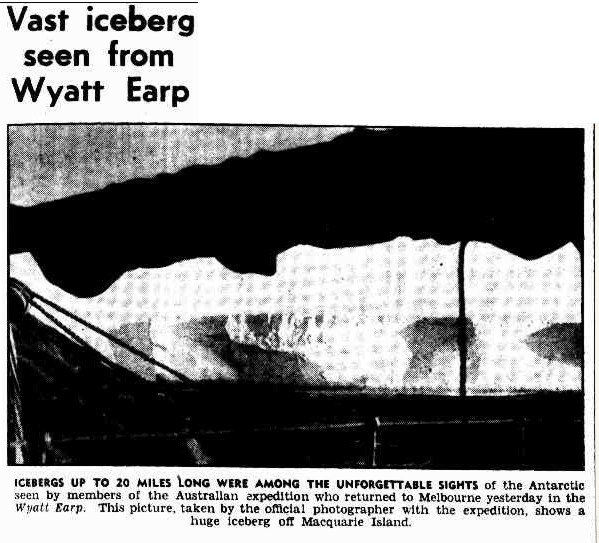 having passed in the Southern Ocean an iceberg 15 miles long and 200ft high. During the morning saw a great number of bergs, and at noon were about five miles from an ice island. The side next us was over five miles in length N.N.E. and S.S.W., and from 50ft to 400ft. high. It was across our course, so hauled to the north and steered northtill 6 a.m. nest morning. When passing this ice island we could see that it extended a long way to the South east. THREE men who made the first successful plane landing on afloating island of ice in the ArcticOcean, camped today 60 miles fromthe North Pole. The U.S. Air Force,which has named theisland Fletcher's Island, hopes to make a "semi-permanent" weather station there. NEW YORK, Mon. - The world's northern-most inhabited island normal population: 12 men and one dog- has been abandoned and its residents sent back to their home bases, the UnitedStates Air Force announced yesterday. The island is "T-3" - or Fletcher's ice island - a floe of flat-topped Arctic ice that has floated around the North Pole region with U.S. Air Force scientists aboard it for the past two years. MELBOURNE, Mon.-An iceberg,estimated to be three miles long and rising 300ft out of the water,was sighted off Capetown two weeks ago by the British ship Condesia, which berthed, at South Wharf to-day. It is very unusual for such a huge iceberg to be so far north at this time of the year. On November 7 when in latitude 43.29 deg. south and longitude 103.24 deg. east,the officers of the ship Dimsdale, which arrived at Port Adelaide; from New York on Monday, sighted a magnificent iceberg a few miles from the ship. The berg was first seen by the man on the look-out at5.30 a.m., and at 10 o'clock the ship passed within half a mile of it. It presented a beautiful, though awe-inspiring, appearance as it towered in a jagged mass high above the ship. The officers estimate that it was a third of a mile long and over 180 ft. high, and was the largest they had ever seen. It was not nearly so broad as long, but no accurate idea of its magnitude in this direction could be obtained. All ships in the North Atlantic have been warned, to follow their courses, with extreme caution to avoid a mammoth iceberg which has drifted into one of the main northern shipping lanes.The iceberg was last reported 270 miles south-east of Argentia, Newfoundland, and drifting south-east at 30 miles daily. The United States Coast Guard has been trailing the iceberg since it broke away from icefields, north of Newfoundland, 13 days ago. From the vault - how many little horses? 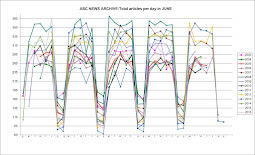 Last word on ABC's Climate Time-lie: "Ordovian"
Where to put Chris Uhlmann? Update: Mt Everest melting! But who says it's so?